According to Hubspot, in 2017 there were 3.7 billion email users across the globe. By 2020 that number is predicted to rise to 4.3 billion users. How would you like to know the exact day and time to send your next email that will guarantee the best chance for your message to be seen and read? We started by analyzing 123.7 billion emails over a seventeen month period of time. We then grouped the emails by day of the week and time of day. Below you will see which days of the week are best to send emails. Note a score of 100 means this is a perfect day to send your email. 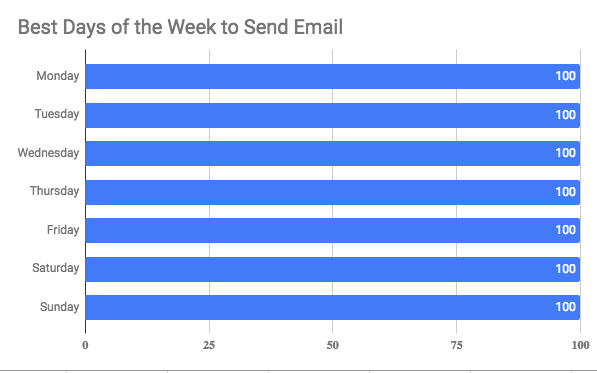 Next we crunched the data to determine what time of the day we should be sending emails. Here are the results based on a 24 hour clock. Note that you will want to select a time of day that displays a score of 100. Congratulations! So now you know the very best day of the week to send an email and the very best time of day to send an email. In summary, it doesn't matter. 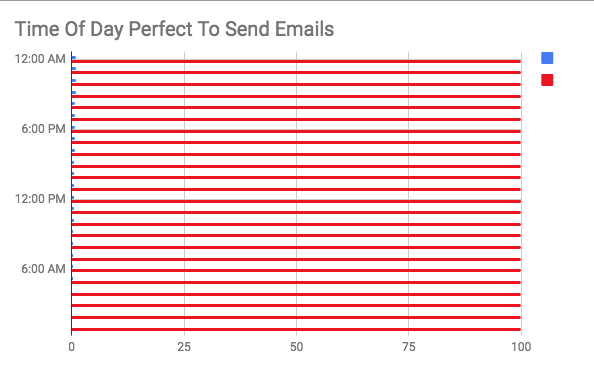 The minute someone publishing a research paper identifying the best day and time to send an email, a text, launch an ad - everybody loses their mind and immediately starts to use this data and schedules their message for that perfect time. Consumers are suddenly buried in messages at this exact moment, negating the very reason this "day and time" previously worked. Once again, spend less time trying to cheat the system and spend more time on writing a relevant Email (or Text). Spend time on the very things you can control. Relevant content. Perhaps something that the client / prospect would want to read.